During the process of revamping your kitchen, there may be one feature you have not considered: folding glass doors. 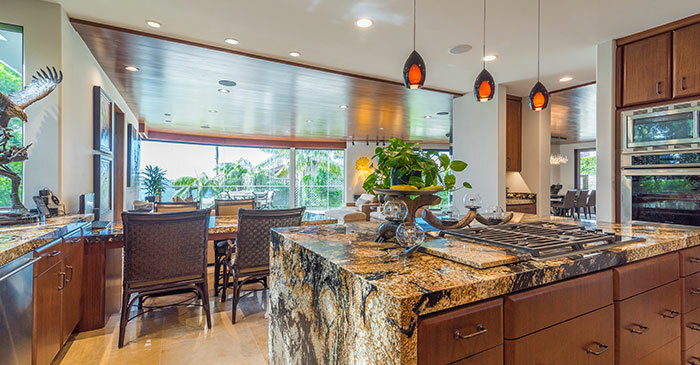 In fact, folding glass panels for kitchens bring a number of benefits to your home. 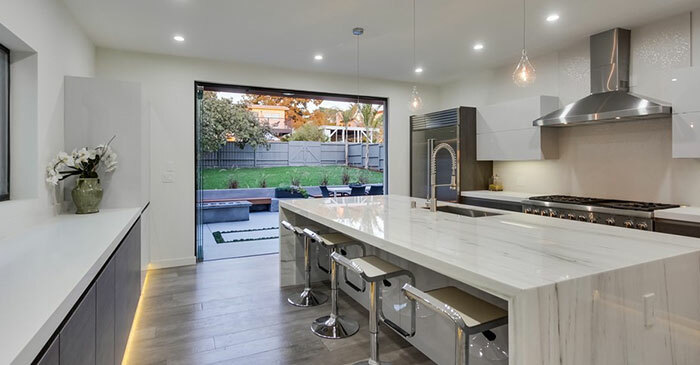 For inspiration of how you can use frameless sliding glass doors for your kitchen, check out these examples of homeowners who did it right. In this first home, the folding glass doors take full advantage of the fact that the kitchen opens onto a deck. They expand the kitchen into the outdoors to form one large space, which is ideal for entertaining, whether the homeowners want to throw a large party or take a dinner party outside to enjoy some warm evening weather. The second photo shows how little space the folding glass doors require to create a large opening. Plus, not only do the panels stack to the left side, the lower track sits flush with the flooring. Both of these factors mean that nothing interferes with movement between the kitchen and yard, which is excellent for gaining more space around the kitchen island, such as for keeping guests nearby while preparing food or drinks. In this next example, the exterior is almost an extension of the interior. 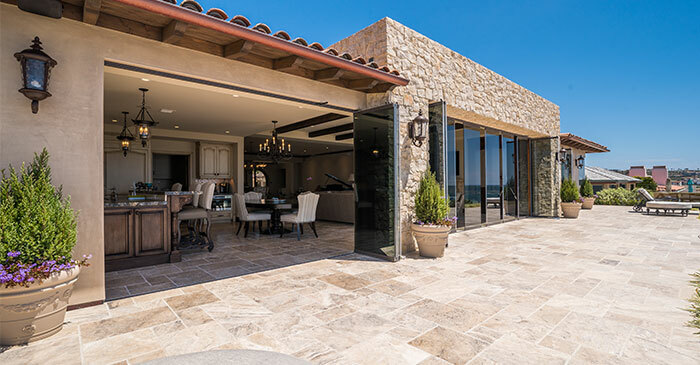 To make full use of the patio, the home features two folding glass systems that cover the entire length of the kitchen and dining room. To reduce energy bills, the homeowners chose Low-E, tinted glass, which limits the amount of light that enters and offers optimal insulation. The last home uses large frameless glass doors to allow plenty of sunlight into the kitchen, enhancing aspects of the decor like the marble countertops and light-colored wood. Combined with the white walls and ceilings, the glass panels brighten the room considerably. Finally, the doors are directly opposite both the workstation in the kitchen and the dining room table, which allows both the homeowners and their guests to take in the views. 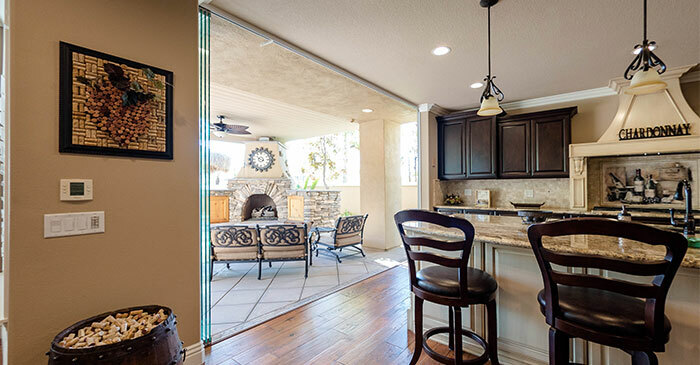 Whether your kitchen opens out onto your yard, you want to create a flexible space indoors, or you are looking for more ways to add value to your home through your kitchen remodel, folding glass doors for kitchens are a great solution. Be sure to choose a glass system where the panels stack out of the way to make the most of the available space. You should also seek a system with recessed bottom tracks to prevent a barrier between the kitchen and the outdoors or dining room.